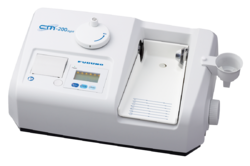 Our product range includes a wide range of ultrasound bone densitometer cm-200 light. High Accuracy• Adjustment of Measurement Site : To measure the center of the heel bone and enable precise measurements, the footplate has 5 adjustable levels. Data Management by Utility Software• Dedicated utility software for data management is available with the CM-200 light. Connecting the CM-200 light to a PC with the utility software installed not only enables data management, but also enables accuracy control and registration of patient information. Bluetooth® Connectivity (option)• Wireless connectivity with the device and PC is available with Bluetooth®. You will be free from a complicated wiring, and broadens the possibilities of installation space or operational flexibility. Easy-to-Use• Simple step for measurement and procedure display of accuracy management enables easy-to-use interface for everyone. Short Time Operation• Easy-to-operate, and approx. 10 seconds for the measurement. Portable Compact Design• CM-200 light is easy to carry and can be used in any area. Utility Software• Utility software for CM-200 light data management is available as a standard accessory.